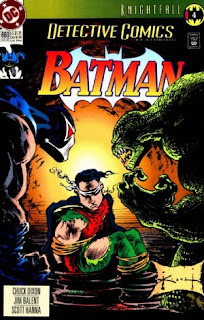 In part four of Knightfall Robin, Bane and Killer Croc take center stage. During this story Bane and his crew, Zombie, Trogg and Bird, walk around the streets of Gotham reveling in the fact that people are home behind locked doors. Bane leaves the group to hit the rooftops and continues to go around the city alone. But he's not alone because he is being tailed by the boy wonder, Robin. While tailing Bane, Robin keeps trying to get in radio contact with Batman. After the battle at the Bates School for Girls with Mr. Zsasz, Batman is getting some rest on top of the school. Bullock finds him and wakes him from his much needed rest. Bullock tells Batman that he should go home and get some rest, but the Batman just ignores him and continues to search for more of the escaped Arkham inmates. Batman tries to respond via radio to Robin only to find out that Robin is out of range. After being spied on, Bane gets the drop on Robin and knocks him out. When he comes to, Robin is blindfolded and is told by Bane that he will be held hostage until the Batman can come to rescue him. Robin, not wanting to be used as a foil for Batman, tries to fight past Bane. In the large sewer area when Bane is holding Robin, Killer Croc gets keen to what's happening in the sewers. He can smell Bane and he remembers it was Bane who broke his arms. Killer Croc attacks Bane and destroys the Venom packs on his forearms. Croc tells Bane that he won't have his secret weapon to help him this time. Bane tells Croc he does not need Venom to beat the likes of him. During the fight the scaffold that was holding Bane, Croc and Robin collapses and they fall into the river below. Croc and Bane fight in the water while it looks like Robin is going to drown beneath the sewers of Gotham. Heheheh. I can just picture it now, Batman taking a lazy cat nap on the roof. That's good stuff. You fool, Batman don't take no cat naps! !